Cyclosorus lebeufii (Baker) W.M.Chu, Acta Bot. Yunnan., Suppl. 5: 44. 1992. – Polypodium lebeufii Baker, Ann. Bot. 5: 461. 1891. – Dryopteris lebeufii (Baker) C.Chr., Index Filic. : 274. 1905. – Christella lebeufii (Baker) Holttum in B.K.Nayar & S.Kaur, Companion Handb. Ferns Brit. India: 206. 1974; Holttum, Kew Bull. 31: 332. 1976; Boonkerd & Pollawatn, Pterid. Thailand: 221. 2000. – Thelypteris lebeufii (Baker) Panigrahi, Notes Roy. Bot. Gard. Edinburgh 33: 498. 1975; Tagawa & K.Iwats., Fl. Thailand 3: 423, f. 44.1–3. 1988. – Type: Godefroy-Lebeuf 69, Cambodia (holotype K; isotypes BM, P). Nephrodium biauritum Bedd., Suppl. Ferns Brit. Ind. : 68. 1892. – Cyclosorus biauritus (Bedd.) Ching, Bull. Fan Mem. Inst. Biol. 8: 197. 1938; Tardieu & C.Chr., Fl. Indo-Chine 7(2): 385. 1941; Holttum, Dansk Bot. Ark. 23: 232. 1965. – Thelypteris biaurita (Bedd.) C.F.Reed, Phytologia 17: 263. 1968. Rhizome long creeping, 1–2 mm diam. ; scales up to 2 by 0.3 mm, brown. Stipes 12–22 cm long, stramineous, dark at base, hairy on adaxial surface. Laminae narrowly elliptic, acute at apex, a little narrowing downwards, 24–40(–45) by 8–11 cm, pinnate; rachis densely hairy above, glabrescent below, hairs setose, transparent, unicellular or with occasional septa(e), up to 0.7 mm long; pinnae 9–15 pairs, middle ones larger, narrowly lanceolate, acuminate at apex, broadly cuneate to subtruncate at sessile base, 4.5–5.2 by 1.2–1.6 cm, basal acroscopic segments often larger (more than twice as large as the next along in basal pinnae), deeply lobed to more than half-way towards costa, lower pinnae about 4.5 cm apart, a little smaller downwards, the terminal pinna up to 6 by 2 cm, narrowly subtriangular with attenuate apex, basal veinlets joined with the opposite ones, excurrent veins running towards the callous-membrane, second basal veinlets usually running to the margin of lobes above base of sinus; costa, veins and veinlets setose hairy on both surfaces. 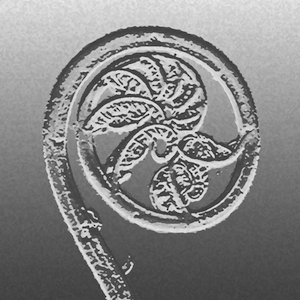 Sori round, medial, with naked sporangia; indusia small, fugacious , densely setiferous. On clayey soil along river at low altitudes. Kerr 10153, Kanchanaburi, Sisawat (K); Larsen 8809, Kanchanaburi, Sai Yok (K).